John Frederick Nelson from Belfast, Co. Antrim is buried in Belfast City Cemetery, Belfast, Co. Antrim. He died in an aviation accident while serving with the Royal Air Force Volunteer Reserve in Yorkshire, England. Sergeant John Frederick Nelson (1796160) served in the Royal Air Force Volunteer Reserve during World War Two. He was the younger son of John Nelson and Dorothy Louise Nelson of 206 Roden Street, Belfast, Co. Antrim. John had an older brother, James Nelson. Sergeant Nelson died on 7th February 1944 aged 21 years old. 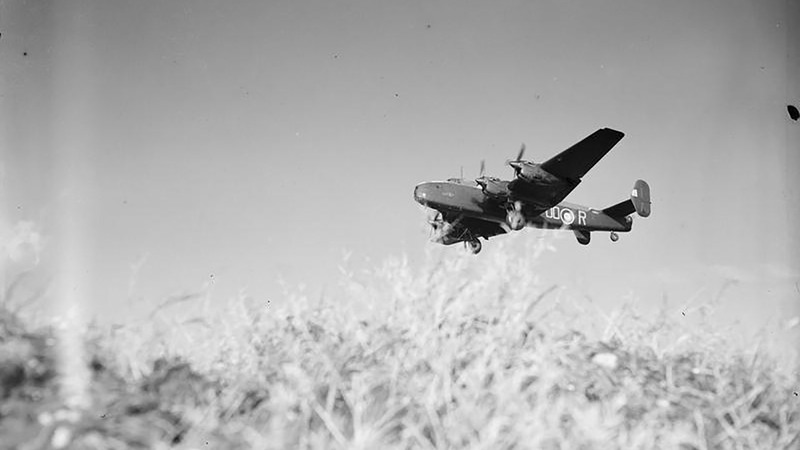 At the time he was with RAF 1663 Heavy Conversion Unit. He was the Flight Engineer on board Handley Page Halifax DK192 OO-N that came down on Garrowby Hill, Bishop Wilton Wold, North Yorkshire. The crew took off from RAF Rufforth, North Yorkshire on a daytime training flight. The Mark V plane came down in low cloud around 1015hrs killing 7 of the crew and one civilian after hitting the summit of Garrowby Hill. Imperial War Museum Photo: (CH 11529) (Part of the Air Ministry Second World War Official Collection). Handley Page Halifax of RAF No. 1663 Heavy Conversion Unit based at RAF Rufforth North Yorkshire on a training flight over the Yorkshire Moors. Copyright Flying Officer W Bellamy - Royal Air Force Official Photographer. After the impact, the plane crossed a road near Painsthorpe Farm before catching fire. A milk lorry traveling on the road became involved in the accident. The driver, Arthur Wood Kirkby, from Hill, Yorkshire died as a result. He was 39 years old and served in the Home Guard as well as working for the London and North Eastern Railway. Mr. Jim Sissons of Bishop Wilton, Miss Ruth Tunley of the Women’s Land Army, and Mr. Ted Cook from Painsthorpe Farm were first to arrive at the scene. Mr. Bill Loft, Mr. Harris Fisher, and the Bishop Wilton Fire brigade arrived soon after. One of the crewmen escaped the wreckage and ran to the rescue party. Authorities took him to York Hospital but he died later of his injuries. Hodson Alfred John Shirley Flight Lieutenant Instructor Pilot RAFVR 130663. Holder of the Distinguished Flying Cross. Killed aged 30 years old. Bright Stanley Flight Sergeant Trainee Pilot RAFVR 1042582. Killed aged 22 years old. Nelson John Frederick Sergeant Flight Engineer RAFVR 1796160. Killed aged 21 years old. Meyler John Kingsley Flying Officer Navigator RAFVR 151321. Killed aged 25 years old. Smith Kenneth Sergeant Wireless Operator/Air Gunner RAFVR 1577088. Killed aged 22 years old. McDonald Peter Gordon Sergeant Air Gunner RAFVR 1822055. Killed aged 19 years old. Booker Sidney James Sergeant Air Gunner RAFVR 1866190. Died of injuries aged 18 years old. Kirkby Arthur Wood Civilian Lorry Driver Home Guard. Died aged 39 years old. Alun Emlyn-Jones, crew’s regular bomb aimer was not on board on 7th February 1944 as he was already in York Hospital with a burst appendix. There, he heard the news of the crash. He later completed his training and joined an operational RAF squadron. In later life, he was part of efforts to erect a memorial to the men at the crash site. An unveiling of the stone monument took place on 8th May 1996. John Frederick Nelson’s grave is in Section L1, Grave 304 of Belfast City Cemetery, Belfast, Co. Antrim. Officers and men of the Royal Air Force acted as pallbearers at the funeral service on 14th February 1944. Reverend Robert Anderson of Richview Presbyterian Church, Belfast, Co. Antrim carried out services at the family home and by the graveside before a trumpeter sounded ‘The Last Post’. If you enjoyed this post on "John Frederick Nelson", please share with your friends and followers.